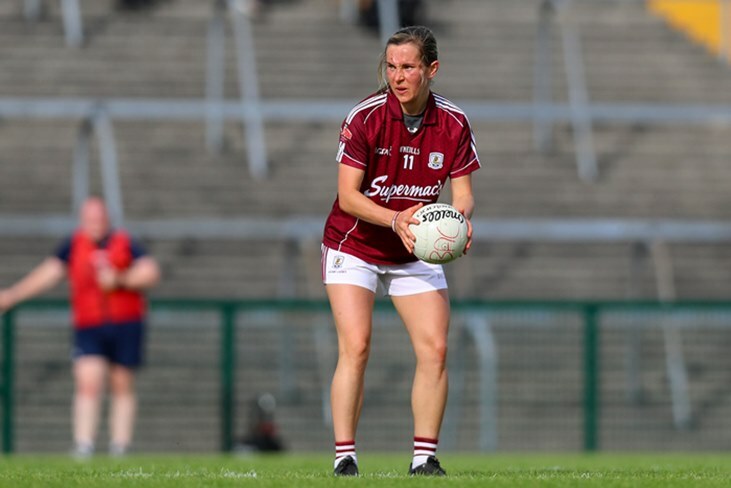 Captain Tracey Leonard helped Galway to top spot in the Lidl National Football League Division 1 with victory over Donegal in Corofin – their sixth win from seven games in the competition. The home win and results elsewhere mean that the sides will meet again in the semi-finals at a neutral venue in two week’s time. Playing against a strong breeze, it was the Donegal girls that made the faster start. Two quick scores from their captain Karen Guthrie got them up and running, but Galway responded well with two good points from Tracey Leonard to leave the sides level after ten minutes. Guthrie was a thorn in Galway’s side throughout and she added another brace of points, but Mairead Seoighe’s score left the minimum between the sides after the first quarter. Galway then hit their purple patch. First a Megan Glynn score was followed up by two quick points from corner-forward Leanne Coen, before Glynn’s quick free then found Tracey Leonard who calmly slotted the ball to the back of the net. There was better to come for Galway though. Almost straight from the restart a defence splitting run by Olivia Divilly resulted in a penalty, and the kick was rifled home by Roisin Leonard to put Tim Rabbitte’s side in total control. Guthrie replied with her sixth point of the day for Donegal, but Galway were still ahead at the interval, 2-8 to 0-6. Both sides swapped scores in the opening 15 minutes of the second period, with Guthrie and Ryan kicking points for Donegal, while Galway’s scores came from Barbara Hannan and a Tracey Leonard free. Galway furthered their advantage with scores two more Roisin Leonard points and one from substitute Rhiona Ni Flahartha, while a free from Niamh Hegarty just about kept Donegal in touch. A final score from Hegarty was little more than a consolation for Donegal, with Galway finishing with a comfortable nine-point win the end. Another dominant performance from the Connacht champions. Scorers – Galway: T Leonard 1-3 (1f), R Leonard 1-3 (1-0pen, 1f), L Coen 0-2, M Seoighe 0-1, M Glynn 0-1, O Divilly 0-1, B Hannon 0-1, R Ni Flahartha 0-1. Galway: L Murphy, F Cooney, S Lynch, B Hannon; S Molloy, S Burke, C Cooney; L Ward, L Gannon, O Divilly, T Leonard (c), M Glynn, R Leonard, M Seoighe, L Coen. Subs: S Conneally for M Seoighe (38), O Murphy for C Cooney (44), R Ni F for L Coen(44), B Murphy for B Hannon (52), C McCarthy for M Glynn (59), A Thompson for R Leonard (59), A Coen for L Gannon (59). Donegal: A McColgan, A McGlynn, E Gallagher, E McGinley, N Carr, N McLaughlin, N Boyle, T Hegarty, M Ryan, K Guthrie (c), N Hegarty, A Boyle Carr, S McGroddy, R Friel, J Trearty. Subs: S McLaughlin for T Hegarty (HT). K McClenaghan for J Trearty (48), N McDonald for R Friel (54).